The world is in chaos. Nigerian women are being kidnapped and abused by the Boko Haram. Pakistan is harboring the terrorist Taliban. Syrian refugees are creating a major immigrant crisis in Europe. The Greek economy is in shambles. The Puerto Rican economy is worse than the Greek economy. ISIS is wreaking havoc in Belgium, France, and the Middle East, with Al Qaeda, Hamas, Hezbollah assisting in the effort to spread Islamic Jihad around the world. We have a Presidential election with two misfits running for office, embarrassing America globally. Putin is terrorizing the Russian people and the Zika virus and Brazilian corruption are threatening the 2016 Olympics. So what is the biggest story on the front page of the New York Times this week?! Eleven states are suing the federal government over whether or not transgenders have the right to use the bathroom of their choice. Wow! Clearly, America has its priorities straight! First, let’s take a short trip down history lane, noting that when the Founding Fathers designed the First Amendment protections, it is highly unlikely that they had Caitlyn Jenner in mind! In the 1960’s, when America was struggling with Black Power and the rights of minorities, First Amendment rights stood as the model for which America was founded. In 1879, when Elizabeth Cady Stanton and Susan B. Anthony fought for women’s right to vote, they were heroines. When the 19th Amendment was finally passed in 1919, it was a just ending, a tribute to the courage of these suffragettes. When Americans staged sit-ins and protests against the Vietnamese War, there was a sense of righteousness in our actions that helped citizens feel proud. Today, we have a Supreme Court that is divided. We have eight members currently, with party affiliations that slant decisions. With the recent death of Antonin Scalia, we can expect that there will be entirely too many votes that result in 4-4 decisions, with little justice being meted out. We have a stalemate in Congress where they will not even consider a Presidential nominee because the Republicans are hoping for a White House victory in November, one that will result in a Supreme Court candidate with more conservative views. One prime example is a recent default decision, a 4-4 stalemate resulting in a no-decision regarding non-union workers paying fees. Who suffers from this inadequacy? The answer is simple, the American people! A default decision is a victory for chaos, a victory for a Congress that no longer represents the people of this once great country. Then there is the ACLU, the American Civil Liberties Union, an organization that is so far left in defending the First Amendment that they could easily fall off the cliff of sanity. They claim to uphold the Constitution of the United States, while they bring the economy of this country into negative dimensions by costing us billions of dollars in frivolous lawsuits over the rights of a minority so small that some of us rarely encounter them in our lifetime. So now let’s get back to the “transgender crisis” or whatever the Hell it is! 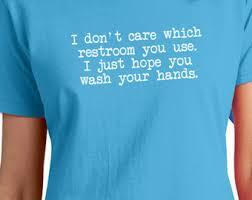 Personally, I could care less if a transgender individual invades my bathroom. If I am uncomfortable, I have the choice to leave. But it is more than likely that I would just ignore the situation. Secondly, it is highly prejudicial and illogical to believe that a transgender individual presents a greater threat upon entering a bathroom than any other individual. For the record, I consider it a personal affront that there has never been an issue of bathrooms for drag queens. A young adult recently educated me regarding this issue, stating that children’s minds are a blank slate. If we, the adults, do not fill their minds with prejudicial attitudes, children will not develop biases. Note: One might agree that this is true of teenagers. Young people, e.g. between the ages of 7 and 13 years of age, might be more sensitive to the situation. I might envision that an eleven year old girl having a transgender boy/girl enter her bathroom would probably find the situation extremely discomforting. This young adult stated definitively that he would be indifferent to a transgender teenager entering the boy’s bathroom. This attitude might be accurate in New Jersey; maybe not so much in the mid-West and Deep South, specifically North Carolina. Has it occurred to anyone but me that there is the possibility of some transgender individual preferring to have a separate, designated bathroom? There has to be a process of adjustment for transgenders, one where they have to find themselves, where their friends and families have to adapt to a new reality. For young transgenders, one would imagine that it might even be more difficult, with people looking at them with blank stares, treating them like outcasts. I am certainly not an authority on the issue, but I do remember a time, not so many years ago when gays had a difficult time “coming out”, in fear of the ramifications. It took many years before the level of tolerance in our society for gays reached the point where gay marriage would become legal. That does not change the fact that there remain strong feelings among many religious groups that gay marriage is unsanctioned in the Bible and not to be tolerated in their world. So why should we be even remotely shocked that these same groups do not want “transgender freedom to use the bathroom of their choice”. The transgender issue is being totally embraced by the media. Articles permeate magazines and blog sites. It is the “it” topic of the day. “Target” clearly used the issue to promote its brand. They were willing to accept the backlash to have their name plastered all over TV and newspapers. Few Americans truly believe that the Target Corporation cares either way. It was just following the old mantra: “there is no such thing as bad publicity”. There is one humorous aspect of this ridiculous media circus. President Obama wants the legislation regarding “transgender bathroom freedom” to be part of his legacy. It is hard to calculate which is more ludicrous: believing that he can force legislation down the throats of right wingers to accept transgenders into male and female bathrooms, or his believing that Iran can be trusted to honor a treaty to ban nuclear weapons. Obama should really be laying off whatever medication he is currently taking!